When Jeremy and I were first married, we invested in a trimmer set so I could give him haircuts at home. I had never cut hair before, and so I was fortunate to have an adventurous and forgiving husband. After learning to cut Jeremy's hair, I figured I would be just fine cutting my kids' hair. I had no idea how hard it would be. My son hates anything touching his head. He gets so upset when I cut his hair that I have considered taking him to a specialty kids' salon. Two things have held me back, the price ($20 and up), and the fact that my son has a hard time with strangers. Luckily, things are getting better. 1. Giving warning. 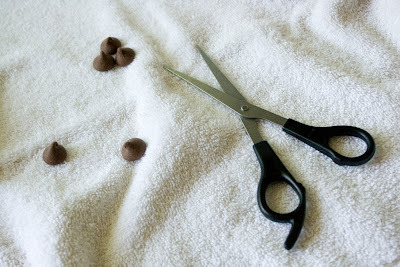 Before my son had his bath in the morning, I talked about cutting his hair. I also let him know that he could watch his favorite movie while we did it. By the time the bath was over, he was talking about getting his hair cut. He actually agreed to it. 2. Good setup. I put a chair with a booster seat strapped on sideways (so the back of the chair wouldn't block access to his head). I used a vinyl tablecloth as a drop cloth, and we were ready. 3. Ditch the trimmer. My son hates it. He does better sitting a little longer for a scissors-only cut. Some kids might do better with just trimmer, since it would be fast. 4. Distraction. Some kids are okay if they have something really neat to play with. Kids salons usually have cartoons. I put on a DVD. 5. Talk. My son needs lots of persuasion, reassurance, praise for sitting still a few moments, etc. Some kids might just want to know what's going on. I also let him know that if he moved around too much, I would pause the movie (I followed through on that a few times). 6. Bribes. I hate using candy as a bribe. Usually there is something you want to do for your kids anyway that works, like reading a book or going outside, but haircutting needs a very powerful bribe at my house. Today I pulled out the chocolate chips. They worked. Two big chocolate chips was enough for my son to let me trim above each ear. Ten or twelve chips total, and my son had short hair again. So that's how we made it through a kid's home haircut. It takes some problem solving, but it really is doable.